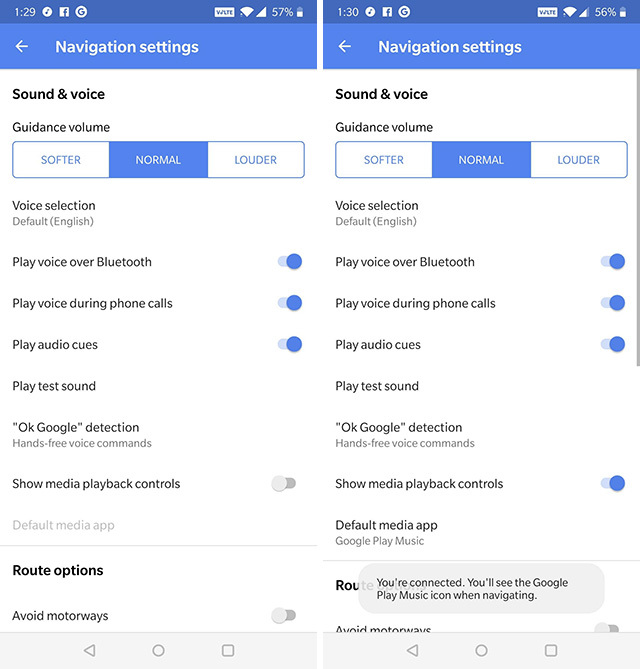 Now you’ll be able to control music playback directly from the Maps’ navigation interface. Cool right? 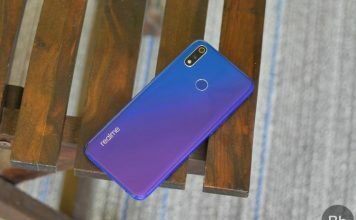 Do note that as of this writing, this feature only works with Google Play Music on Android, and Apple Music on iOS. Enter the destination as you usually would do in Google Maps and tap on “Directions”. Now before you tap on “Start”, tap on the three-dot menu at the top-right corner of the screen, and choose “Add stop”. Now you can add a stop to your trip. Furthermore, you can rearrange the order of these different stops to the one that you plan on taking. You will notice that as you rearrange this order, the “Total trip” duration gets updated accordingly. Also, as you keep adding stops, you get the option to add one more each time. When you are finally done adding all the stops that you want, tap on “Done”, and to start your trip, tap on “Start”. Bonus tip: While navigating, if you tap on the search icon on the screen, you can find nearby places like gas stations, restaurants, coffee shops, etc. If you are planning to go on a long road trip, chances are your route will have a few tolls, if not many. However, with Google Maps, you can choose a route that has the lowest number of tolls possible. 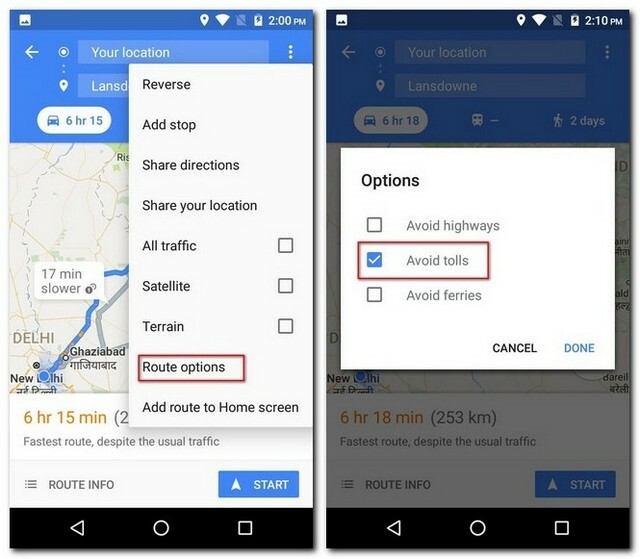 This feature is very handy, especially if you are traveling on a budget and don’t want to spend your money paying tolls. 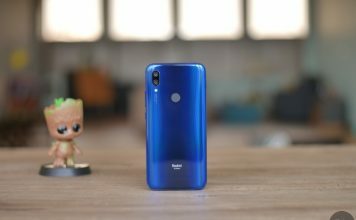 To know how to use this feature, read the steps below. 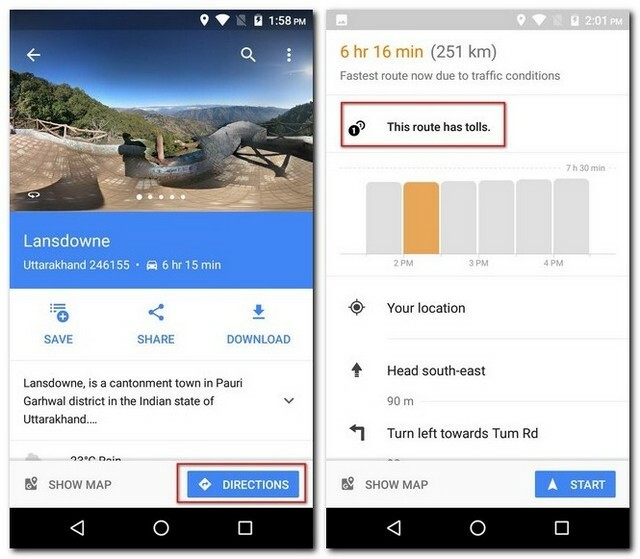 Search for your destination on Google Maps like you normally would, and then tap on “Directions” to see the route. If you tap on “Route Info” at this point, you will see if the best route has tolls. Now go back on the map and before you start the navigation, tap on the three-dot menu and select “Route options”. From the three choices that you see, check the one that reads “Avoid tolls” and then tap on “Done”. Now if you tap on “Route Info”, you will note that either there are no tolls on the new route or the number has been reduced to the minimum possible. You can now go back and start your navigation as usual. Note: This method usually increases the distance of the trip, so you may want to take that factor into consideration as well. Do you often find yourself parking your car in open spaces just to forget where you parked it? Not anymore. 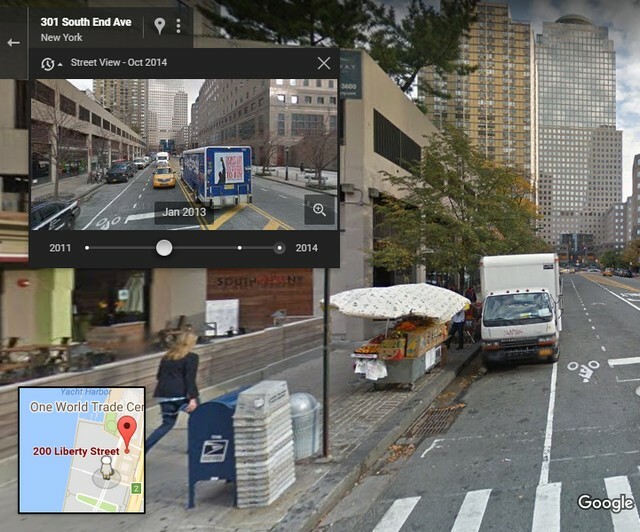 The next time you park your car, just remember to save the parking location on Google Maps. To know how to do that, read the steps mentioned below. 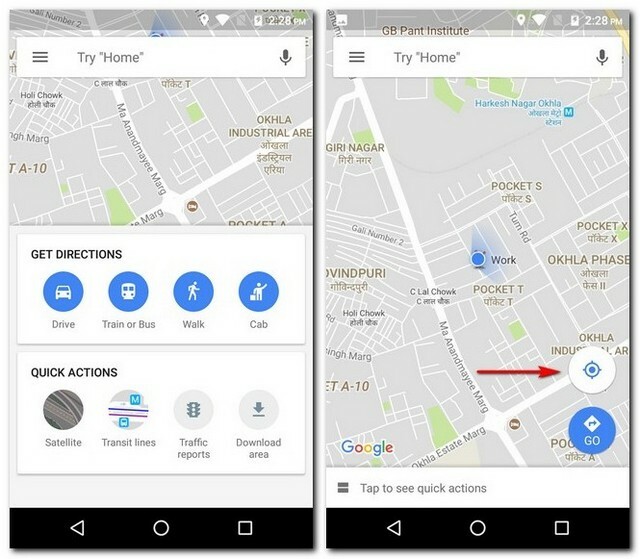 When you open Google Maps, you will see the quick actions layout. Tap anywhere on the screen above that to view the map on the full screen. Now tap on the location icon on the bottom-right to center your location on the map. Having done that, you should should now see a blue dot on the center of the screen. Tap on it and select “Save your parking” from the list that appears. 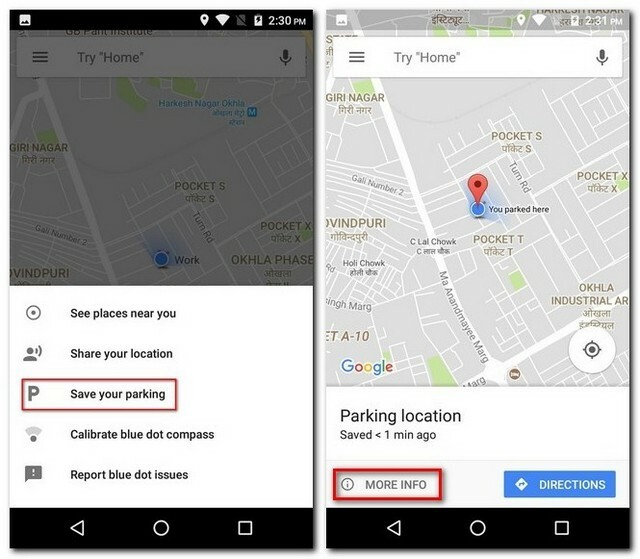 This will save your parking location on Google Maps. You can further modify it by tapping on “More Info”. When you swipe up from the bottom of that screen, you can add notes for your reference, specify the time left if the parking is charged on an hourly basis, and even add a picture of the surroundings to help you find the location easily. If you do specify the time left, you will get a notification when your time is about to get over. 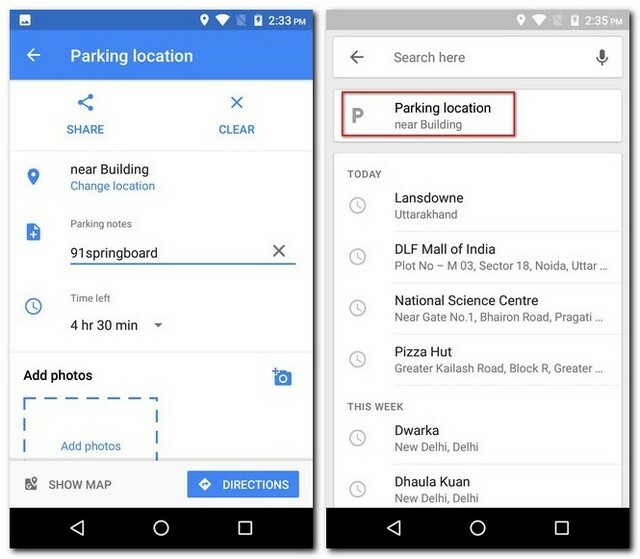 Now when you want to find your parking location, simply tap on the search bar and you should see a label named “Parking location”. Tapping on this will navigate it to your car. Bonus tip: If you use Google Assistant on your device, you can ask it to tell you your parking location. 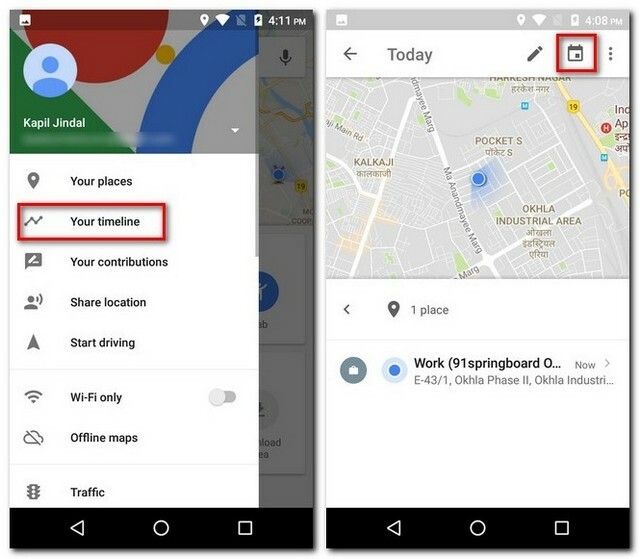 In Google Maps, open the hamburger menu and select “Share location”. On the following screen, tap on “Get Started”. 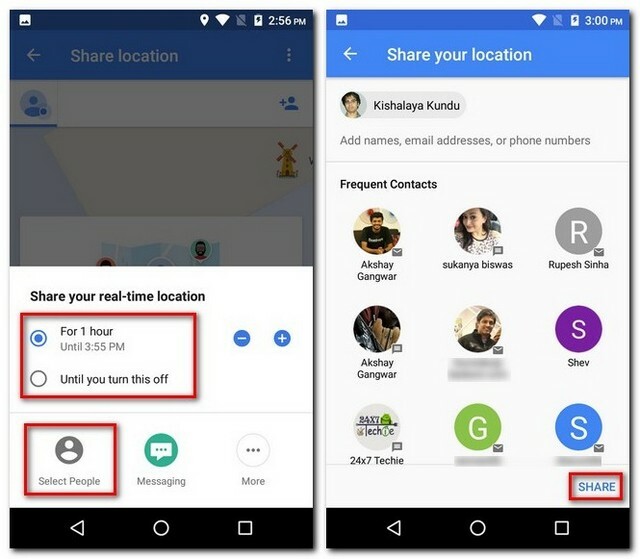 Here, you can either select a particular time duration for which you want to share your real-time location or do that infinitely until you turn it off manually. On the same screen, tap on “Select People”. Now enter the email addresses of the people you want to share your real-time location with and then tap on “Share”. 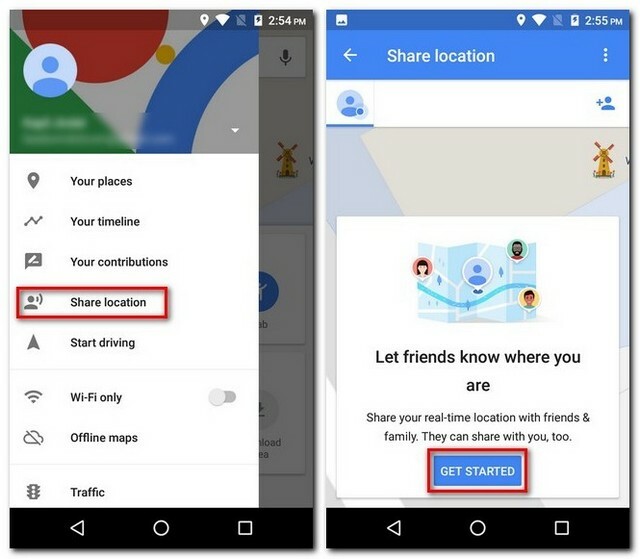 Now when the people with whom you shared your location tap on “Share location” on Google Maps on their devices, they will be able to track your location in real-time. 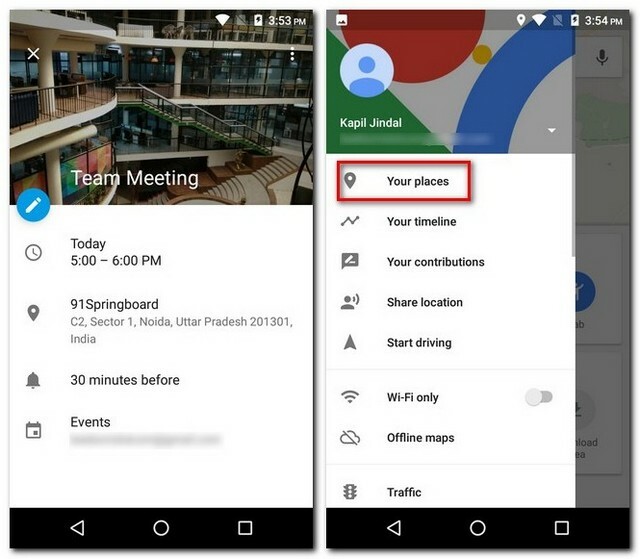 In the hamburger menu of Google Maps, tap on “Your timeline”. On the next screen, you will see the timeline for the present day. If you wish to view it for any other day, you can do that by tapping on the calendar icon at the top-right of the screen. 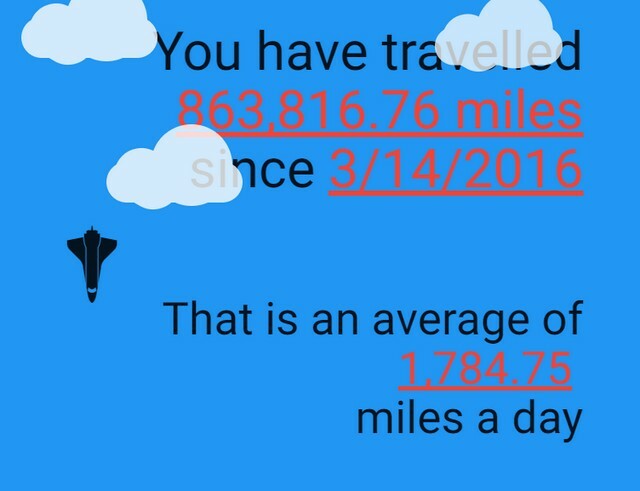 Now when you select any day, you may see a graphical representation of the routes that you took that day and details like total time and distance spent traveling. Note: You must have Location History enabled in your device for this feature to work. 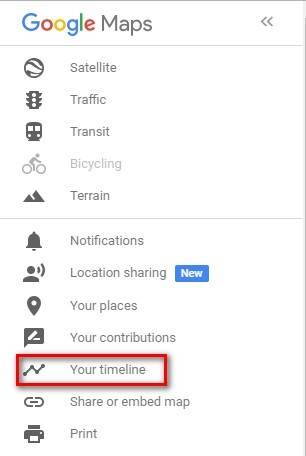 Open Google Maps’s web client, and select “Your timeline” from the hamburger menu. This will open a new window of your Timeline. On this window, click on the gear icon at the bottom-right of the page, and select “Download a copy of all your data”. 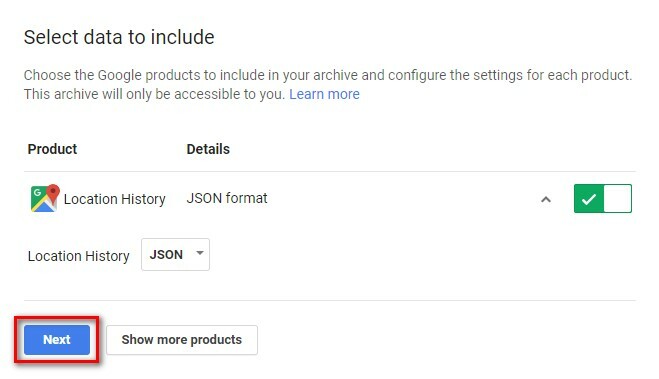 On the following page, make sure that “Location History” is selected and format is “JSON”, and then click on “Next”. Keeping the file type as .zip, download it. 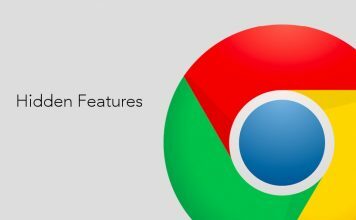 Once the download is completed, unzip the JSON file and save it on your computer. Now open the GitHub link and upload this file. After a few moments, you can scroll down and view the detailed information that you’ve been waiting for. In the search bar of the Google Maps’s website, search for the place that you want to visit. 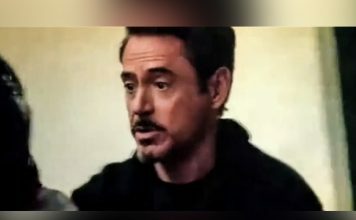 Then on the bottom-right of the page, you will find a small yellow-colored icon shaped like a human. Drag and drop it to the point which you want to view. Now you can click on the history icon, after which you should various year stamps. You can just click between these years to view that place over several years. This is an easy yet a great feature that not everyone knows of. With this, you can travel around most of the world virtually. Note: Not every location has the history feature. Public transport is one of the easiest and the most cost-effective ways to travel. However, if you don’t know the correct transit information, it is of no use. 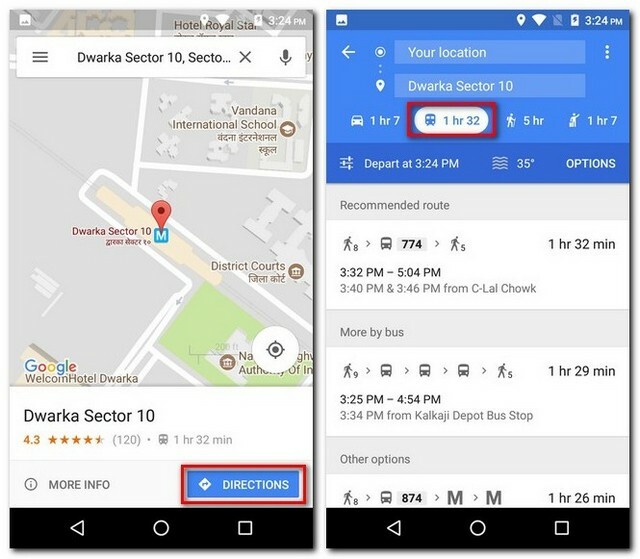 So to know about the transit information, use Google Maps from now on. And to do that, search for your destination on the app and then tap on “Directions”. On the next screen, tap on the transit tab (second from the left) to view different transit options. You can now tap on any one to view the detailed information. This is a very easy method to follow and can save you a lot of time and money. This method will work only if you have an upcoming event in your Google Calendar or your Gmail. 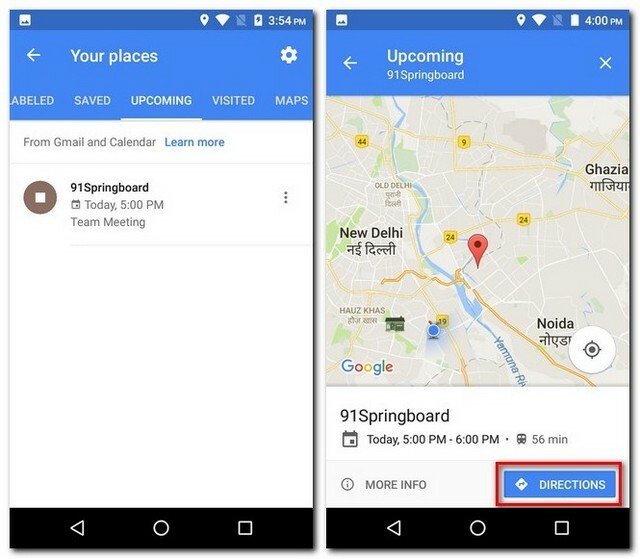 On your Google Maps app, open the hamburger menu and tap on “Your places”. On the following screen, tap on the “Upcoming” tab. Here, you’ll find the locations mentioned in your upcoming events. Tapping on any one of these locations will point them on the map, and then you can tap on “Directions” as usual. 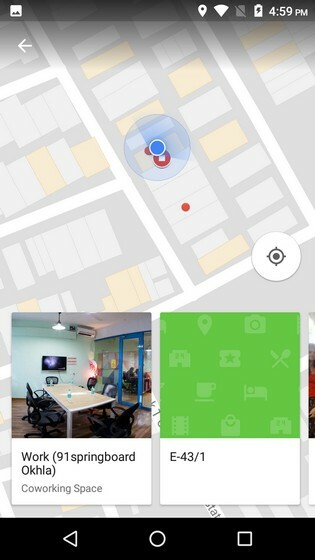 On the first screen of Google Maps, tap anywhere to minimize the quick actions. Then tap on the location icon on the bottom-right to center your location on the screen. Now tap on the blue dot and select “See places near you”. You will now see a list of all the cool places near your location. You can tap on any one of them to get its directions. How annoying is it when we take one of our daily commute routes and come across an unusual heavy traffic. However, this situation can be avoided if we use Google Maps’s real-time traffic conditions. To use this feature, go to the hamburger menu of the app and tap on “Traffic”. Now you will see different colored lines over the roads. Just like you see while navigating, the green line represents light traffic; orange line represents moderate traffic; and red line represents heavy traffic. You can use this to your advantage and plan your commute accordingly. Have you ever wanted to reach a destination and checked the rates for the same on different cab apps? If so, you may have noticed that the same app may not offer the cheapest price all the time. 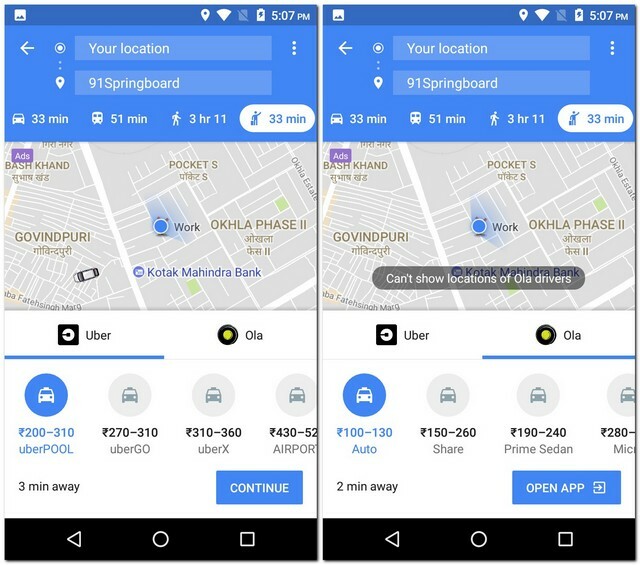 If you are already tired of switching between different apps, you can compare their prices from within Google Maps. To do this, simply search for your destination and tap on the transit (rightmost) tab. You should now see a few cab apps and their rates for each of their cab variants. 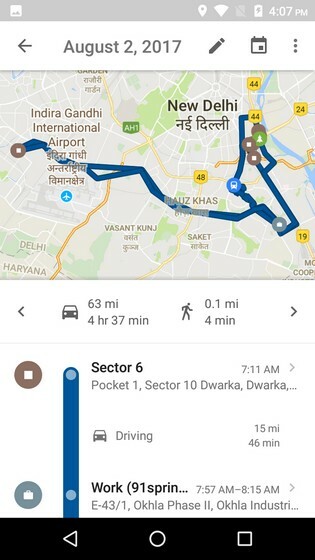 While most cab apps can be opened from within Google Maps, Uber cabs can be booked from Google Maps itself. Have you ever wanted to go to a particular shop in a mall or at the airport that you know exists but can’t seem to find it? Well, the next time you find yourself in such a situation, simply take out your phone and open Google Maps – it’s that simple! In fact, Google Maps will show you the floor-wise directions as well. Not only that, if you aren’t at the mall or the airport currently, you can still see this feature working. 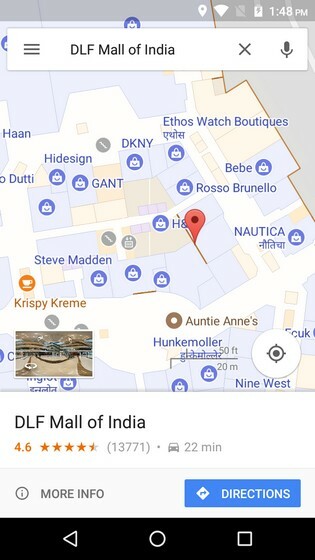 Simply search for the mall or the airport, and zoom in to that location. Note that the floor-wise directions may not be available unless you are physically present at that location. There may be times when you have to travel to a place where there is no internet connectivity. 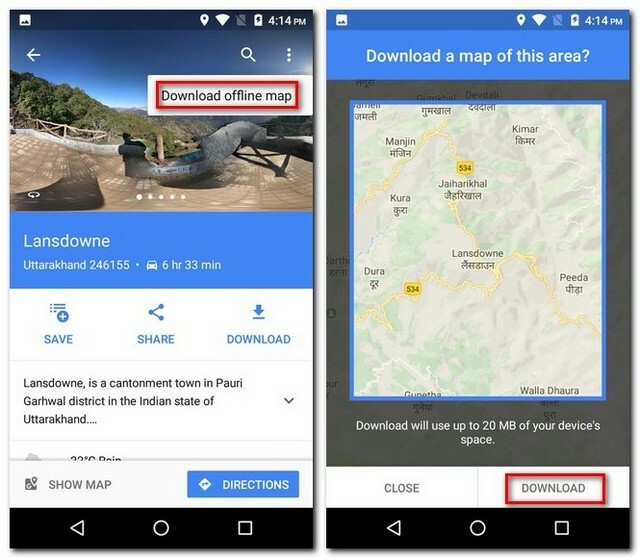 In such situations, you can use Google Maps to download the map of a certain area for offline use. 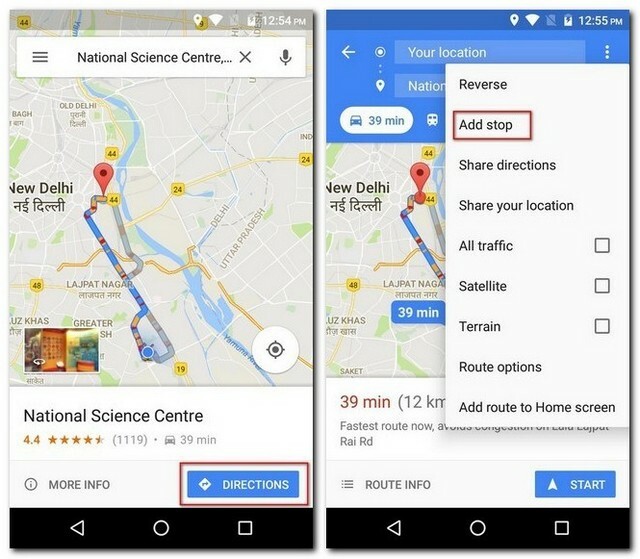 To do this, search for your destination in Google Maps and then tap on the three-dot menu. Here, tap on “Download offline map”. You will now be taken to a screen that has a map of that area. You will also see that some of that area is marked under a square. This marked area is the one that will be downloaded. So, if you want, you can adjust the position of the square accordingly. Once you’re happy with the selected area, tap on “Download”. 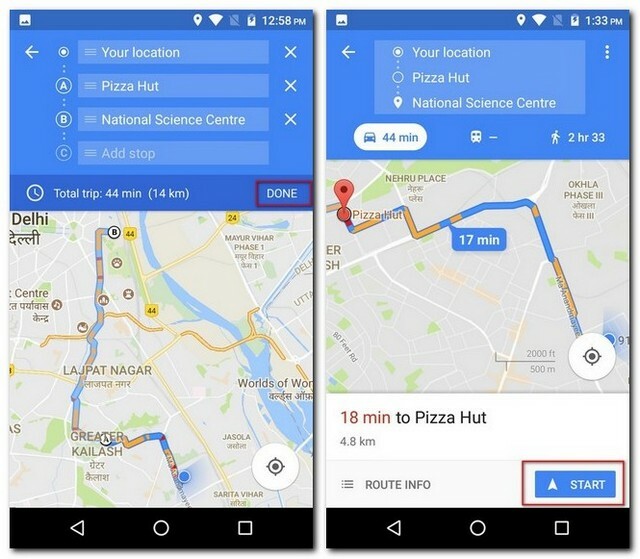 Once your offline map is downloaded, you can open the hamburger menu of Google Maps and tap on “Offline maps” to view the saved map. 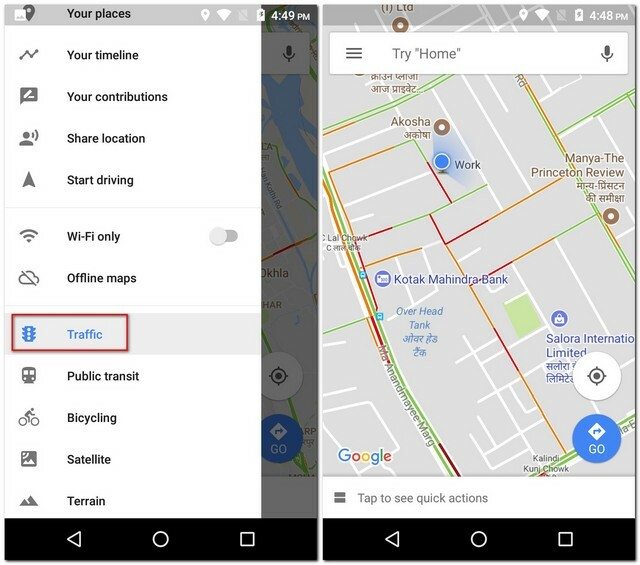 Even if you were already using Google Maps, you can now make the most out of it with these Google Maps tricks. 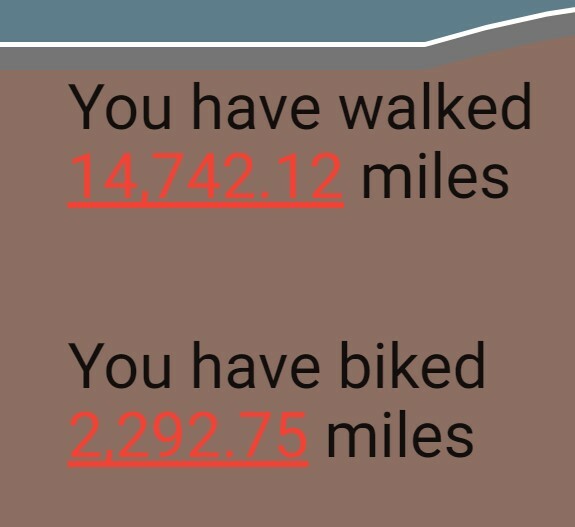 There are many other things that you can do with Google Maps, but these were the ones which I thought would be the most useful. 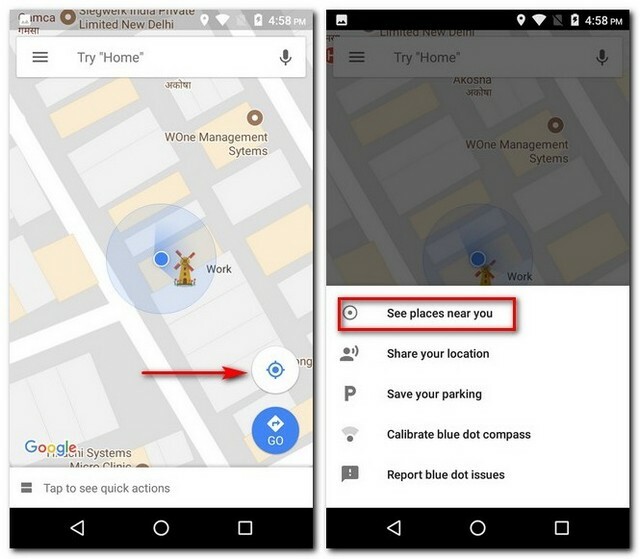 Are there any other cool Google Maps tricks that you know of that we might have missed out on? Do let me know in the comments section below.